A couple of days ago my NASUWT magazine dropped through the letterbox and, as always, it makes for pretty depressing reading. If the contents are to be believed, most teachers hate the profession and would rather be doing something different that is less stressful, has shorter hours, and is better paid. And the source of all of this pain and suffering is squarely laid at the feet of the Coalition Government. It’s not really surprising that this is the rhetoric coming from a teaching union that has vehemently opposed this government since its first days in office. Teachers, along with doctors, nurses and the majority of other public service workers, have had a rough ride over the last few years, but honestly, how much better would things be if we hadn’t ended up with a Conservative – Lib Dem coalition? If we want a serious answer, this is not the place to be looking. Whichever way you look at it, my Teaching Today magazine is little more than a piece of anti-government propaganda full of negative statistics. The repeated strapline is “On 7 May 2015 vote for education”. The problem is that I’m left with no idea what a vote for education is. No alternative is offered. In fact, nothing positive is offered at all. I have no idea what the parties’ policies on education are without going away and doing my own research. Perhaps Ukip offer the brightest future? Who knows? This is vacuous politics at its very worst. It has nothing to do with a left/right/Conservative/Labour battle of ideas, because there are no ideas offered at all. It offers no hope, no vision, no better future. All it stirs up is disillusion and blame. Such a hollow and antagonistic approach is likely to become a key feature as the General Election approaches. Labour will blame the Coalition for the effects of austerity. The Conservatives and Lib Dems will blame Labour for the mess they inherited in 2010. Ukip will blame the main parties for the moral state of our society, and the SNP will blame everyone else for Scotland’s woes. Unless something fresh pops up from behind the scenes, it looks as though new policy will be thin on the ground over the next couple of months. As the fight over the centre ground intensifies, with the focus on who might manage the existing system best, political point-scoring and personality politics become increasingly important in order to stand above your rivals. It’s no wonder that voter disengagement runs so high and the claim that our political system is broken is repeatedly made. When the default position in politics is to find fault and failings, it is little surprise that the House of Bishops’ Pastoral Letter was treated with such contempt last week. The right-wing papers took great pleasure in stirring up a Tory backlash against a perceived bias against them. Iain Duncan Smith and others duly obliged. “It is ironic that despite claiming to be non partisan they only produce these reports when Conservatives are in government,” he told Sky News. As well as not being entirely correct, such a typical knee-jerk reaction reverts to a defensive mentality which dismisses anything that might be remotely unfavourable without considering the merit that lies beneath the surface. It is impossible to love Jesus Christ and not to care about the welfare of people in every respect… They are literally the two sides of the same coin. You do one, you do the other. Our concern for the common good stems from us being created in the image of God, and the consequential commands Jesus gives us: that we are to love God, our neighbour, each other, our enemies. Countering criticism of left-wing bias in the Bishops’ Letter, he praised the Government’s commitment to spending 0.7 per cent of our national income on overseas aid; he praised the Modern Slavery Bill. And he praised the Government’s work on preventing sexual violence in conflict zones. He also said that the Church should rejoice that unemployment has fallen. 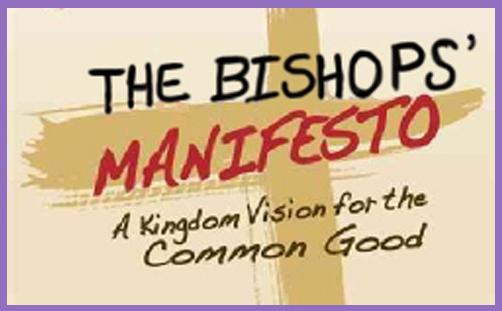 The House of Bishops’ Letter is far from infallible, but it does look forward to a new form of politics that restores the bond between the public and political classes. It jars and confuses because it deliberately avoids party political language. It looks for hope and the formation of a new overarching political narrative that seeks to acknowledge the worth in every person whatever their personal circumstances and level of material wealth. This is just not how politics is done these days. Instead of being short-termist, relying on focus groups and policies aimed at particular demographic groups that are designed to win votes, this is about going back to the fundamentals of what society should be and how morality and community can be re-established at its core. The vision, as much as there is one, primarily comes from the Bible and the ways Jesus presented the Kingdom of God that brings heaven to earth. It is a belief that through those values everyone benefits, especially when virtue becomes the means of shaping the political landscape. The Bishops cite two examples of visions of society that “changed the political weather” – Clement Attlee’s Labour administration 1945 and Margaret Thatcher’s Conservative administration of 1979. Both addressed the societal failings of the time with new energy and vigour, and both found their inspiration in different ways through the Christian faith. The 1942 Beveridge Report, which laid the foundations for the Welfare State and the NHS, was hugely influenced by the writings of William Temple, then Archbishop of Canterbury, who envisaged a post-war society that reflected the innate dignity of each person created in the image of God. Thatcher’s Methodism led her to see her political task as the moral and spiritual revival of Britain. She believed hard work, thrift, self-reliance and independence to be vital for Britain’s economic success, and that these values were fundamentally Christian. One measure of the stature of these two administrations is that neither was, initially, as lacking in nuance as they have often been portrayed. William Beveridge followed his report on social security with another entitled Voluntary Action which affirmed the principles of personal responsibility and local, informal, activities which built stronger communities. He argued that the state had an important role but that it should not be allowed completely to supplant local and individual responsibility and initiative. Margaret Thatcher was, famously, keen to restore “Victorian Values”, by which she meant not only unregulated markets but a strong sense of duty, self-help and personal responsibility. Part of our tragedy is that our politics has been incapable of holding a careful balance between different kinds of goods or virtues. Beveridge’s enthusiasm for voluntary action was marginalised by the revolution in state welfare provision which his earlier report had initiated. Thatcher’s market revolution emphasised individualism, consumerism and the importance of the corporate sector to the extent that, far from returning to Victorian notions of social responsibility, the paradigm for all relationships became competitive individualism, consumption and the commercial contract, fragmenting social solidarity at many levels. It is our inability as a society to hold on to visions for the common good that requires us to develop new ones over time. In the past it has been Christianity birthing these visions or providing the fuel for them. We have seen a taste of this through the Red Tory and Blue Labour movements which look to Catholic Social Teaching for inspiration. David Cameron’s ‘Big Society’ may have failed to take off politically, but it is alive and well in a more organic form through the rapidly expanding work of churches in their local communities. And now we have the Bishops of the Church of England adding their voice to this desire for a new form of politics. Without the Church following Jesus’ example, who has the moral and social capital to rediscover a rich discourse of the common good in our politics at this time? Politicians have repeatedly failed, trades unions have become increasingly self-interested, and secular humanism has not proved itself. It will not happen overnight, and it will require one or more political parties to take some brave steps. But the seeds are being planted by Godly hands. Blame and animosity may reach new heights as this General Election approaches, but there is something far better emerging on the horizon if we choose to seek it out.